This course is ideal for both experienced childcare practitioners, and students embarking on a new career. This course enables you to develop both your theoretical knowledge and your practice based skills. Teaching is delivered one day per week: 10.00-16.30 full-time or 13.30-16.30 part-time. Personal tutors provide plenty of support throughout your studies. Graduates not only leave with enhanced employability in the childcare sector, but choose from a diversity of progression routes. The underlying theme of the Early Years Practice course is based on an informed approach to the academic study of early childhood, and focuses on facilitating professional development through the process of reflection. Each module will develop student’s ability to explore, discuss, analyse, evaluate and develop their practice with regard to theory, research, policy and recognised good practice. Upon completion of the Early Years Practice degree, students have the opportunity to progress on to the BA (Hons) Early Learning (progression route) course. The course team and the University have a number of ways in which to support and enhance your study skills including face to face with our study support team, electronically through our study skills portal and also through extended reading the library has a study skills section and some texts specifically focus on study skills for mature students. All students are allocated a personal tutor who will offer pastoral support and guidance with regards to your studies. As a practice-based learning course, students will require the support of their employer (paid or voluntary) to successfully complete the qualification. Learners will also need to identify a workplace mentor who will provide professional support, guidance and advice and be a critical friend where appropriate. The areas of study include early years, care and education, children's services and personal and professional development. This course is designed with the child care practitioner in mind and so it has been shaped to combine studying while working in a busy childcare setting. At all campuses the course enables students to earn while they learn and maximise the amount of time spent at work. The children’s workforce has many demands and challenges not least of which is inclusivity in its broadest terms. Since 1989, the United Nations Charter for the Rights of the Child has set the tone for children’s rights at a global level. This module aims to investigate the value and beliefs systems that underpin the children’s workforce. This module builds on the Level 4 Introduction to Early Years Research module and is designed to enable students to develop a critical understanding of formal methods of enquiry and select and justify appropriate methods of investigation. It is intended to introduce students to both the theoretical and applied aspects of Early Years research. Early Years practitioners have a key role to play in working with parents to support their young children. Wherever appropriate, practitioners should work together with professionals from other agencies such as local and community health and social services, to identify needs and provide optimum opportunities for children. This module explores the concepts of transition, the importance of partnership working and vital management skills. There are many and varied pathways for progression for graduates of the Foundation degree and all successful students will have enhanced employability in the childcare sector. Future employment opportunities exist in schools, children's centres, playgroups, nurseries, social care and voluntary organisations. Graduates may also go on to management opportunities within the early years sector, progression to the level 6 course (both on-campus and on-line) leading to postgraduate initial teaching training (ITT) for those wishing to pursue a career in teaching. "When I first began my FdA EYP experience I didn't know what to expect, but from the very first lecture I knew I had made the right choice coming to university. The modules leaders were passionate and dedicated to the subject which injected the students with the same passion and need to learn more. Lectures were exciting, motivating and above all interesting, engrossing you and making you want to ask questions and know more. The support from tutors was fantastic and no question was deemed silly or unnecessary which made students feel at ease. The two years flew by and I graduated with a merit." Julie Lawrence. Part-time Tuition fee: £1,370 per 20 credit module (Please contact the Infozone for further information). Students are required to be in suitable paid or voluntary employment with children for a minimum of 10(PT)/20(FT) hours per week and hold a satisfactory Enhanced CRB or Disclosure & Barring Service check. Your teaching will take place across one of our modern buildings. The Waterfront Building, situated on Ipswich Waterfront, is a contemporary space for lectures, workshops and seminars. 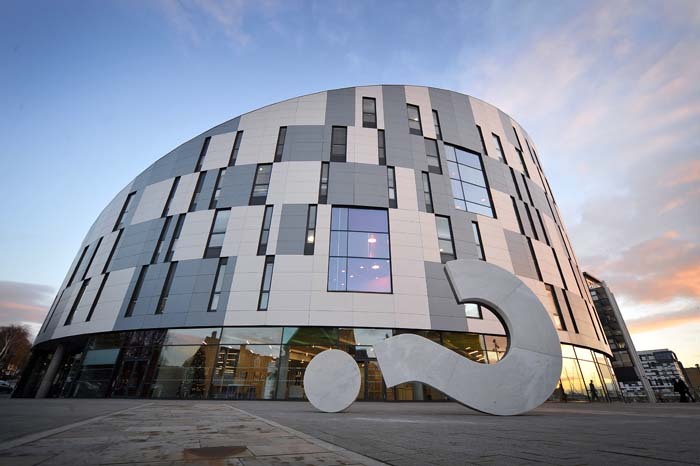 Our Waterfront Building is home to a large auditorium seating 200 people, over 30 lecture rooms and open, flexible study spaces which are home to approximately 50 computers for students to use. Our Atrium Building has recently been refurbished and offers modern seminar rooms, PC labs, our Innovation Centre (IWIC) and an open, airy café for refreshments.